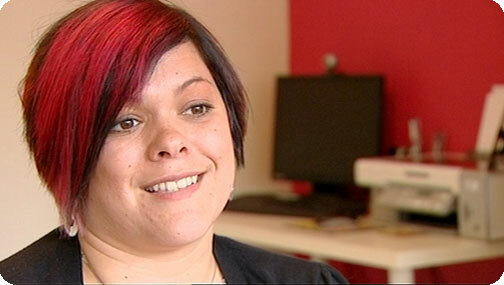 Single mum Yvonne is a 31 year old psychology and criminology student. Her busy life means she quite often eats on the go and goes for simple convenience food when she cooks, admitting she is quite lazy in the kitchen. She has even been known to phone round her friends to find out what they are having for dinner and then invite herself along so she doesn’t have to cook! ‘Do you go for the proper grilled kebabs or the naughty donners?’ Yvonne admitted it was the naughty ones. Then Gizzi asked did she have chips with it and Yvonne, sheepishly, said she did! So, Gizzi then wanted to have a rummage in the fridge and cupboards. The first thing Gizzi saw in the cupboard was Yvonne’s stash of crisps. Yvonne is a bit of a snacker. But, as Gizzi pointed out one bag of crisps has 8.3 grams of fat in it and a woman is only supposed to have 70 grams in a whole day so, a bag of crisps is over 10% of Yvonne’s recommended daily allowance! There were also packets of biscuits and Gizzi asked Yvonne how many she would get through. Yvonne said about half a packet which is about ten biscuits. That’s a massive 39 grams of fat! As Gizzi has explained before, the really calorific part of the bacon is the fatty bit so, she always removes it before cooking it, leaving lean loin pieces. She said if you do remove the fat you save so many calories! It actually reduces its fat content by a massive 80%! Gizzi also used a griddle pan to cook the bacon, cutting down even more on the fat content because it doesn’t sit, cooking in its own fat and, of course, out came the oil pump. Yvonne loves a carby snack but there are better ways of getting your carbs than with stodgy bakery pastry. So Gizzi suggested Rye bread for Yvonne because, unlike processed pastry flour, rye flour is full of nutrients and gives more energy AND helps keep you fuller for longer! Instead of using butter for the bread, Gizzi used a low fat cream cheese. She said it works just as well as butter with fewer calories but, it adds much more flavour. She also added tomatoes and avocados to the sandwich. Avocados are high in calories and fat but, they are part of the Superfood group and are VERY good for you. The fat they contain is the healthy kind though that helps fight cholesterol. Yvonne’s stodgy pasty comes in at a massive 420 calories per portion. 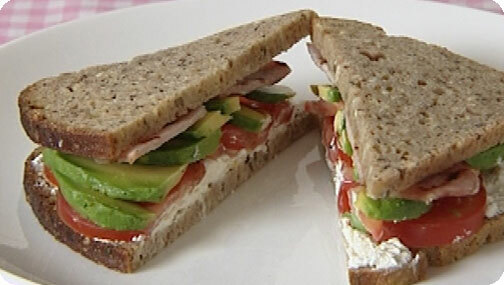 Gizzi’s yummy, filling Bacon, Tomato and Avocado Sandwich on Rye comes in at a deLITEful 295 calories per portion. That’s 125 calories less and the sandwich will boost Yvonne’s energy levels too! ‘It’s got cheese and avocado in it!’ So, the first success of the day. But it doesn’t take an expensive gym membership to get a little exercise into our lives. If Yvonne ran short sprints with her son, for five minutes every day, kicked a ball around the park and then played lifting games for a further five minutes, which would tone her upper body and bingo wings, she could lose a whole stone in a year. Not to mention the fact that her son would have a whale of a time! ‘I wouldn’t even know where to start!’ shaking her head. Gizzi told her that in her donner kebab wrap and chips, there is the equivalent fat as TWELVE LITRES OF BANANA MILKSHAKE! 106 grams of fat and 1785 calories! Phew! Lamb is one of the fattiest meats available and Gizzi said she wouldn’t be able to cut back the fat enough if she used it so, she had decided to use skinless chicken breasts to make Chicken Kebabs with Garlic Sauce. Gizzi told Yvonne she was going to make a crunchy salad for her to go with the kebabs. She said she was going for a Lebanese style salad with white and red cabbage, carrots and gherkins. Kebab Tip: Soak the wooden skewers overnight so they don’t burn when you cook the kebab. Yvonne’s fat-filled donner kebab with chips and garlic mayo comes in at a massive 106.2 grams of fat per portion. 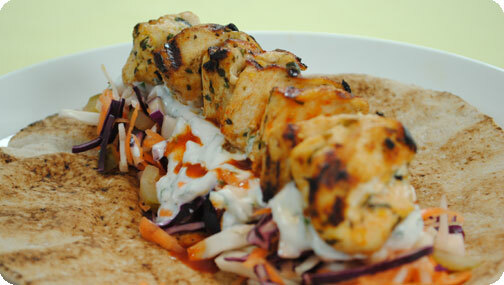 Gizzi’s Chicken Kebabs with Garlic Sauce and a Crunchy Salad comes in at just 8.3 grams of fat per portion. Twelve and a half times less! Yvonne got stuck in to the kebab. In between mouthfuls, Yvonne said she liked it! Yay! Another success! Before Gizzi started cooking her version of Yvonne’s fried breakfast, she asked Yvonne to guess how many calories would be in her normal version. Yvonne said she reckoned on about 600. Way out! There is actually 1270 calories in Yvonne’s fry up – nearly all of the calories she needs in a day! Gizzi started with the mushrooms and said that, instead of frying them, she was going to bake them. She said it helps to concentrate the flavour. Gizzi popped some cherry tomatoes on the vine onto the baking sheet to go in the oven too. With the sausages, Gizzi took out the sausage meat and shaped it into a pattie. This stops the sausage skin holding all the fat in and, because it’s a pattie, it drains off a lot of the fat. She then placed the patties onto the griddle pan along with the bacon. She griddled some lovely looking wholegrain bread and, instead of fried egg, Gizzi cooked a poached egg which on its own saves 30 calories! Good tip there! As an added bonus, Yvonne can have a bowl of blueberries and a glass of juice with her breakfast to help add nutrients and something sweet. Gizzi asked Yvonne if it looked disappointing and Yvonne said it looked great! Yvonne’s normal fatty fried breakfast comes in at a massive 1270 calories per portion. 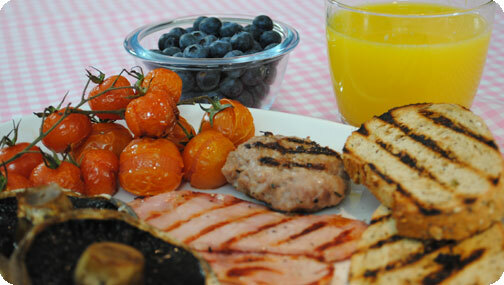 Gizzi’s Griddled Full English Breakfast with Blueberries and Juice comes in at just 639 calories per portion. Including the pudding, that’s half the calories! Gizzi told Yvonne to get stuck in and asked her what she thought and whether she thought she would feel she was missing out if she was given the breakfast. Yvonne said, sheepishly, that she thought it was probably a little bit better than what she would normally cook! Woohoo! Yvonne said she didn’t think she would feel deprived with the dishes Gizzi had shown her. So, a real triumph for Gizzi. If all Yvonne does is change her three downfall dishes for Gizzi’s new deLITEful dishes and does the playground workout with her son every day, she could lose the one and a half stone she wants to get rid of for her graduation in three months. Now that is how you cook yourself thin!